Jack Chandler alto sax, Tom Sharp trumpet, Ben Lowman tenor sax, Harry Orme guitar, Sam Jackson bass, Steve Hanley drums. 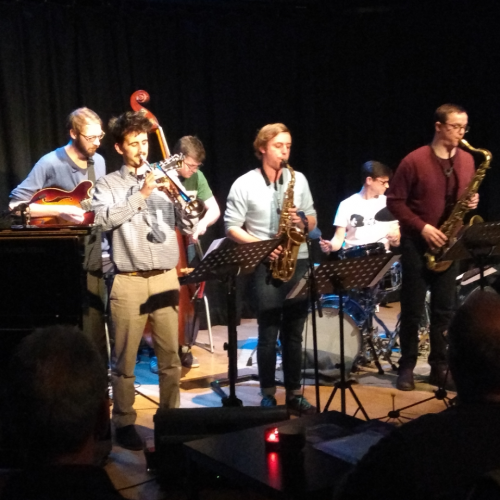 The Jack Chandler sextet combine the arrangements of larger ensembles with the dexterity and improvisation of small groups. Influences range from Tristano, Ellington, Paul Desmond, and the music covers a range of standards from many eras and some originals. The band play complex but hopefully tasteful charts with some of the best musicians on the Leeds Jazz scene.